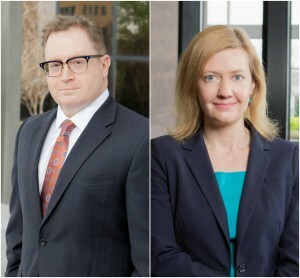 With almost 100 attorneys, GableGotwals has announced the promotion of Tom C. Vincent, II, CRCM, CIPP/US and Meagen Burrows to shareholder status. Tom Vincent had been Of Counsel with the Firm since 2014. With extensive experience in regulatory compliance, his background includes serving as chief compliance officer for different financial institutions, responsible for ensuring compliance with a myriad of requirements including customer protection, privacy, information security, and corporate governance. Tom assists his clients with issues involving data security and privacy, including the establishment of cybersecurity programs, negotiation of appropriate protections for client information, breach identification and required reporting. Additionally, Tom has experience in investment advisory, broker-dealer and fiduciary compliance, and has held various broker-dealer and investment advisory securities licenses. Meagen Burrows has been an associate with GableGotwals since 2013. She has a general business transactional practice, with particular emphasis placed on providing legal support for employers and healthcare enterprises. Meagen’s recent experience includes employment contracting (and related employment issues), healthcare services contracting, business formation, business and practice acquisitions and sales, joint venture transactions, and transactional matters relating to other types of partnerships or affiliations. Meagen specializes in regulatory compliance analysis (including the Stark law and the Anti-Kickback statute) and assisting individuals and businesses as they navigate the complicated regulatory and compliance issues facing them.